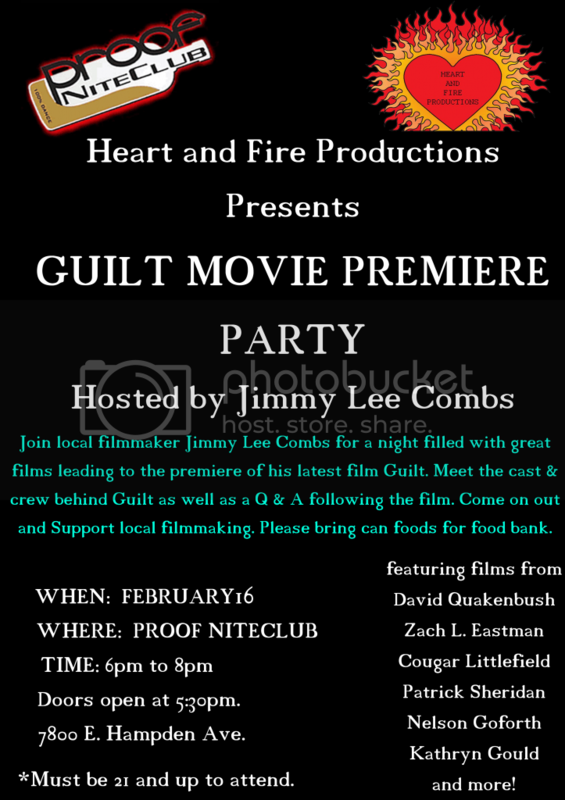 Join local filmmaker Jimmy Lee Combs who will be hosting several short films all leading up to the premiere of his latest film "Guilt". Meet fellow fillmmakers & actors, the cast & crew of Guilt as well as a Q & A following the film. There will be a cash bar for those who would like to drink. Snacks and soda will be free. And even better the event is free!!! This is going to be an extremely fun night! So come on out, have some drinks and support local filmmaking. More details and surprises will be revealed soon. If you would like to bring a can of food to donate to the Food Bank of The Rockies, it would be much appreciated. Thanks and hope to see you there! For the Love of Fall- A preview to writer/director Jeremiah Zentz's upcoming film. Web of Lies- written by Kathryn Gould, directed by Kathryn Gould & Nelson Goforth. 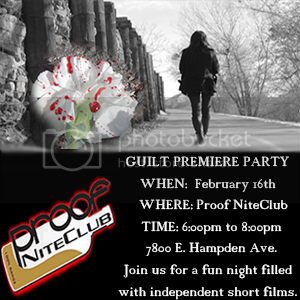 Note: For those who would like to stay and hang out at the Proof after the premiere party, please bring photo ID and come dressed up since they have a dress code.